Solid Surface continues to be fashionable in the bathroom industry for its material properties and stone-like appearance. size 540 x 380 x 140 mm. The Cove basin is available in gloss and matte Solid Surface finish, pure bronze and solid zinc. The Cove basins sharp edges and shape define a modern appearance that asserts the aspect of its material. The sculptural form of this wash basin mirrors contemporary design, and as a result, reflects its oval shape in the reflection of the water, it embodies when brimming. Designed in Australia, Merwe supply the variety of materials in bathroom basins, to suit your requirements. To read about these materials in more depth click here. The Cambridge dictionary says that the Cove means the curved part of a coast that partly surrounds an area of water. The Loch basin is an oval basin manufactured in Solid Surface, Solid Bronze and Zinc. 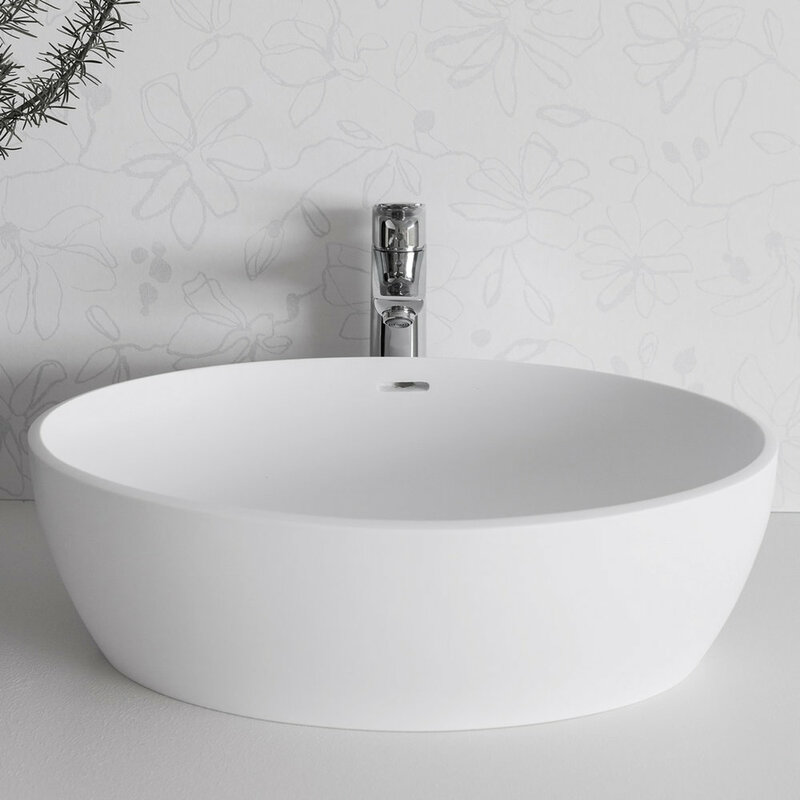 Merwe’s oval basin with soft lines. The Oval Loch wash basin has soft, effeminate lines. This sink reflects a traditional aspect of timelessness. The smooth edge follows continuity as the eye spills over onto the reflection of the water it contains. The design of the Loch basins mirrors the curves of the Bayou bath, making it an exultant chose for a beautiful bathroom. According to Wikipedia, the meaning of Loch (/ˈlɒx/), is the Irish and Scottish Gaelic word for a lake and a sea inlet. The Marsh basin is available in Solid Surface (matt and gloss) Solid Bronze and Solid Zinc. The mirroring effect of the border and base of the basin embodies a timeless design. The Marsh washbasin fit side by side on a small vanity or sits well in a small space like in a corner where space is limited. The Marsh Solid Surface basin has a stone appearance in the matt finish and silky in the gloss finish. Considering the association with water, all of Merwe’s bathroom ware gets named after waterbodies, To explain the word ‘Marsh” the Meriam-Webster Dictionary describes the word as an area of soft, wetland that has many kinds of grass and other plants. The Moat Basin is available in matt & gloss Solid Surface, Bronze and Zinc. The Moat Solid Surface basin is cast and finished to resemble the natural allure of stone. This Popular shaped basin features a sharp-angled rim and is grounded on an easy to maintain base. This stone basin can also be installed as an underslung washbasin. The word Merwe is not only our surname but also means ‘lake’ in Dutch. Therefore, the meaning of Moat, according to Dictionary.com is a deep, wide trench, usually filled with water, surrounding the rampart of a fortified place, as a town or a castle. The Wadi basin is available in matt & gloss Solid Surface, Bronze and Zinc. narrow basin for a powder-bathroom. The Wadi basin is designed to fit in small bathroom spaces. Especially, bathrooms where there is not enough space for a large basin. The boat-like shape of the Wadi basin results in an ecstatically pleasing object in the bathroom. The name ‘Merwe’ is not only the founder’s surname, but it also means ‘lake’ in Dutch. Dictionary.com defines wadi as the channel of a watercourse that is dry except during periods of rainfall. The word originates from the Arabic language. size 565 x 368 x 130 mm. 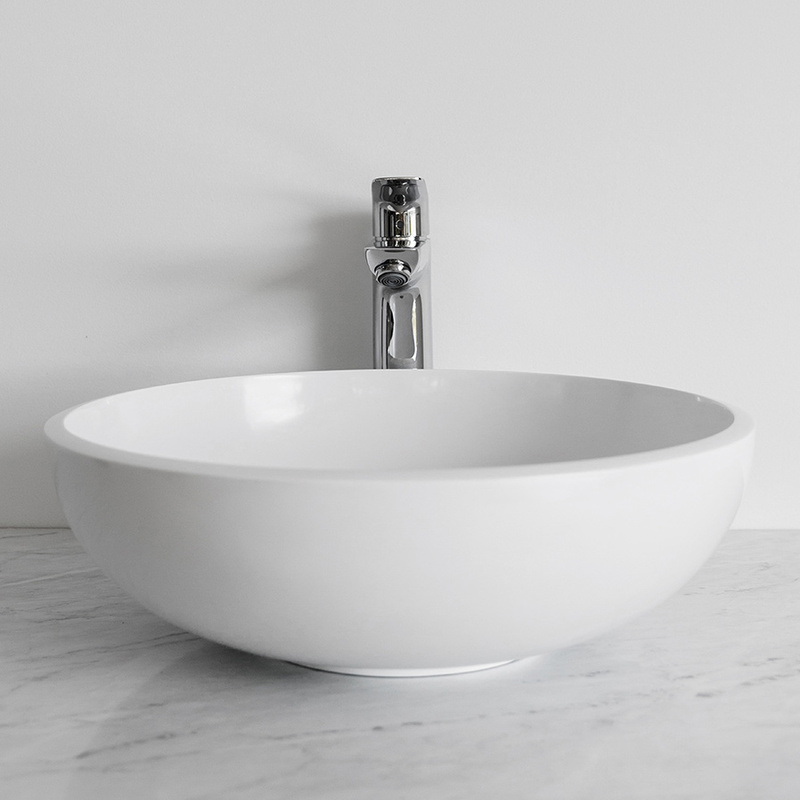 The Channel basin is available in matt & gloss Solid Surface. A perpendicular border frames the Channel basin with a sharp, crisp slanted rim. A Shape obtained by the exceptional level achieved in the artistry of the material and manufacturing process. According to National Geographic, “a channel is a wide strait or waterway between two landmasses that lie close to each other. A channel can also be the deepest part of a waterway. Alternatively, a narrow body of water that connects two larger bodies of water.” (accessed 30 August 2017). size 535 x 425 x 165 mm. The Cove basin with an internal overflow is available in gloss and matte Solid Surface finish.